Plants galore for sale at May Market. 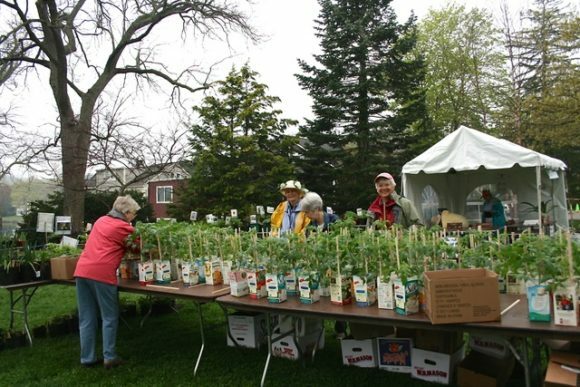 ESSEX — You’re in for a treat on Saturday, May 13, from 9 a.m. to 2 p.m., rain or shine, when the Essex Garden Club will have a one-day extravaganza in the Town Park on Main Street. Just in time for Mother’s Day, there will be herbs and herbal gift creations as well as the Garden Club’s ‘world famous’ garlic salt, made from a closely-guarded secret recipe since 1953. Always the star of Essex May Market are the ever-popular Members Plants. People have been coming to Essex on May Market day for years from all over New England to take advantage of the healthy plants dug and nurtured by the Garden Club members. These plants include perennials, ground covers, grasses and shrubs dug and potted from the garden club members. An early sell out in the Members Plants area each year are the many varieties of tomato plants grown from seed and cultivated carefully. There will be 300 tomato plants, including many heirloom varieties guaranteed to grow in our climate. People start lining up at 8 a.m. to get the finest specimens. On the other side of the park, the Annuals Tent will be stocked with the healthiest hanging baskets, and blooming annuals. Knowledgeable Garden Club members will be available to help with any questions on caring for the plants. Back by popular demand this year is the all-natural compost available for sale. 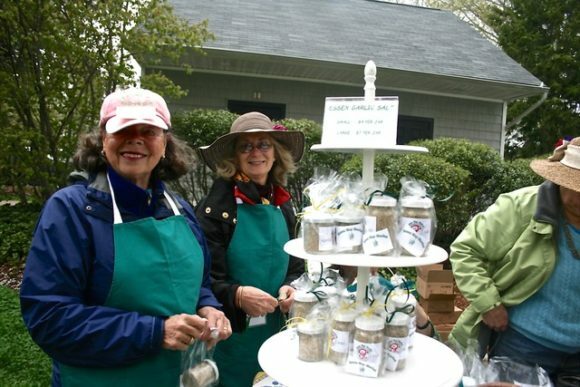 Sales of Essex Garden Club’s ‘World Famous’ Garlic Salt are always brisk. The “Treasures” section is a great place to find gently used pieces of jewelry, garden pieces, planters, books, cnildren’s items, gardening tools and a mix of odds and ends. There will be lots of interesting finds for all ages. The Silent Auction will have an incredible array of goods and services donated from many generous merchants. One of the features of the Market is a Silent Auction. This year one of the Club’s members has made a very special donation to the Silent Auction offerings: one dozen Beatrix Potter collectable figurines made by Beswick Pottery in England. 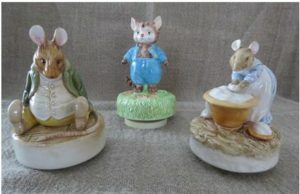 These delightful figurines include many of the storybook characters made famous by the writings and drawings of Beatrix Potter. Three are mounted as music boxes. They were produced under license from F. Warne & Co., the publisher of her stories and thus are faithful to her drawings. And back again this year is the Jewelry Tree. Here you will find an extensive and superb collection of vintage bangles, earrings, necklaces and pins. May Market is the Garden Club’s only annual fundraising event. Proceeds support civic improvement projects, such as beautifying town parks and traffic islands in Essex, Centerbrook and Ivoryton. Plantings are also purchased for the Essex Town hall, Town Park and for public schools serving Essex students. May Market is truly a gardener’s dream. Come early and you will definitely find something beautiful for your garden or a special gift to take home. It is, after all, the quintessential Essex event!